Well, I am back to Christmas cards. Thought I would try a red and green background with some yellow (I was thinking stars). Then sprinkle it with salt to give the effect of snowflakes. I ended up with a blizzard, but I learned to not use so much salt! 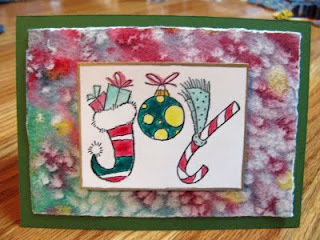 I had the "joy" stamp and watercolored it and edged in gold pen. I put pop dots behind it to make it 3D. I also made noodles this morning to freeze for Thanksgiving. I do it the way my grandma taught me so it was fun to think of her as I worked. Is anyone else feeling like they barely have time to do something for AEDM with Thanksgiving and Christmas coming? Is your home becoming disheveled just at the time of year you want it to stay neat so you are ready to decorate for Christmas? I think I need the accountability of daily posting to make sure I do something and not slide back into seldom going into my creative area. I feel like the daily posting is creating a habit of creating daily, but I am starting to feel flustered. I do plan on pushing through, though. Just pressure from myself, not the challenge. Well, my house is definitely not looking neat, and I have the first of the season's houseguests arriving tomorrow night. 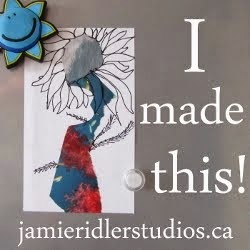 I figure I'll just be known as a slattern, but a really gifted, artsy one. I'm only slightly kidding. Definitely going to have to give that salt tip a try -- did you use watercolor and then salt, or is it acrylics? I know what you mean about barely managing... I recently hired someone to do some housecleaning every other week to help me stay ahead during the coming hectic weeks... the month is nearing an end and I think it will be too easy to let the creativity go next month, unless you include gift wrapping, baking and decorating in there; they are creative pursuits, right? Hang in there!